Eating suckling pig at Warung Ibu Oka in Ubud could have been the single best meal I had anywhere in Southeast Asia. 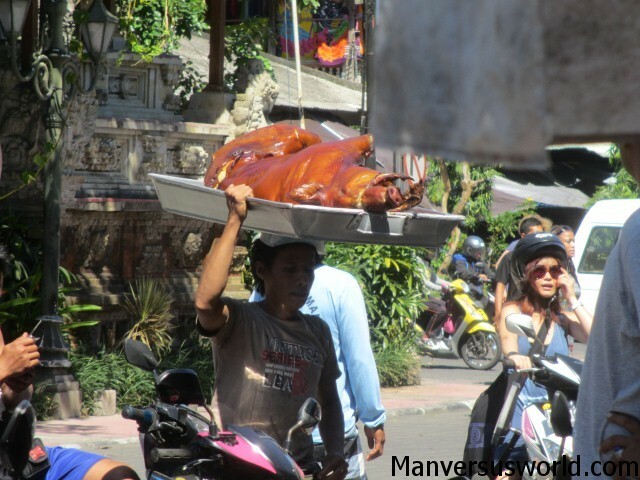 To tuck into a plate of its world-famous roasted pig with rice, spicy vegetables and fried intestines was a gastronomic delight and one of the top four highlights of my time in Indonesia, the others being getting engaged in Bali, swimming with sea snakes and turtles at Gili Trawangan and learning to surf. Sometimes Lonely Planet really knows what it’s talking about. 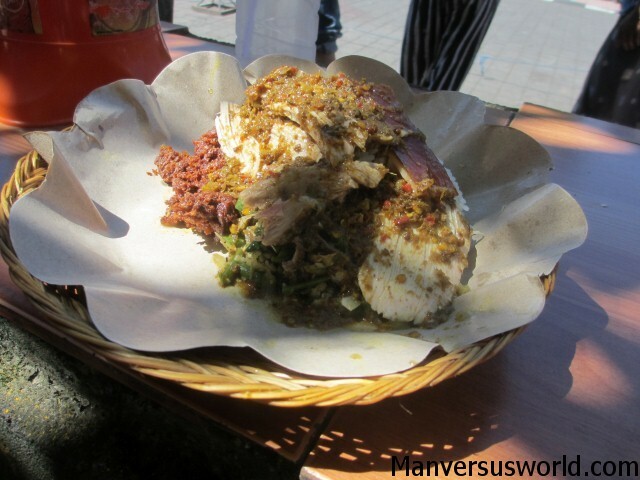 If I hadn’t read about it in Southeast Asia on a Shoestring I never would have known about Warung Ibu Oka and the delicacy known in Bali as babi guling. From all over Ubud, tourists and locals alike descend on the Ibu Oka warung with one purpose in mind: to devour suckling pig. The queues are often long but it’s worth the wait – the service is swift and the food is divine. It’s cheap, too. For less than a price of a Big Mac you can enjoy a plate of suckling pig at Warung Ibu Oka and have enough money left over to wash it down with a cool drink. And I’m not alone in my love for this place – even The Guardian ranks the Ibu Oka Warung as one of the top 10 places to eat in Ubud. So, fellow food lovers and travellers, if you do just one thing in the Indonesian town of Ubud make it a trip to Warung Ibu Oka for a plate of delicious suckling pig. You will not regret it. You might also like to check out Ubud’s sacred monkey forest. My husband and I will be flying to Bali at the end of July and now I know where we’re going to be eating (likely every single day). Asia really knows what to do with pork, but this suckling pig looks particularly amazing. Can’t wait to try it for ourselves! You definitely should! People come from all around to eat suckling pig for a reason – because it’s just so darn good!